While one could mistake it for the similar 875 model, there are in fact quite some differences. Differences that truly make this shoe next level. The 1907 6” Moc Toe is made with the Copper Rough & Tough leather which has a beautiful, scraped look. The color nuances in the leather, due to the amount of oil, create a vintage appeal. Another detail that sets this shoe apart is the Norwegian Welt construction, instead of the regular Goodyear welt. A Norwegian welt is stitched to the sole and to the upper, providing more strength to the sole and makes the shoe sturdier. You could call it a double Goodyear welt. 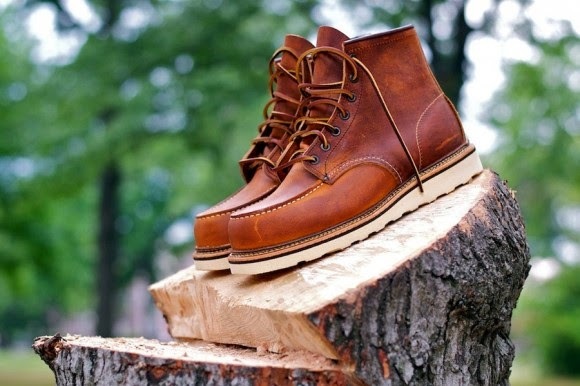 Usually, a white midsole is used by Red Wing if the shoe has a White Traction Tread Sole, but for the 1907 a dark brown midsole was chosen. The shoe is finished with rawhide leather laces for a rugged look.